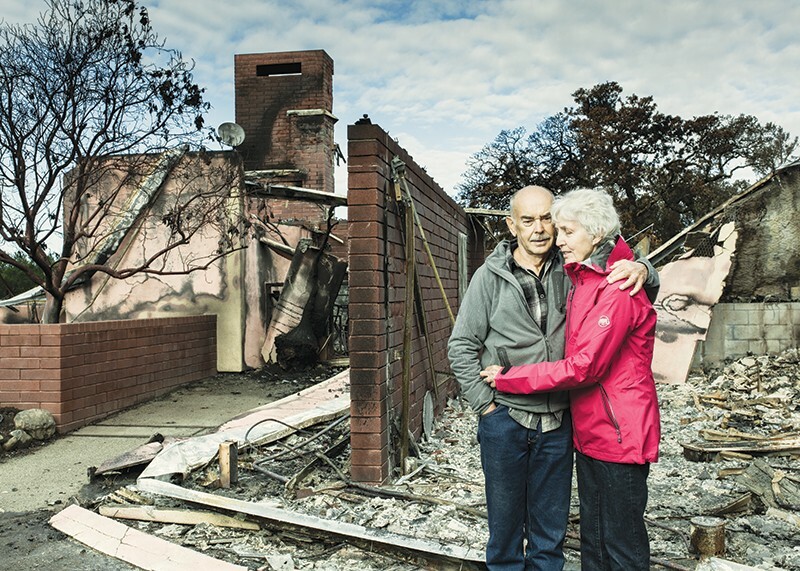 STILL STANDING Fire survivors Johann and Gloria Heinzl pose in front of the remains of their home in a photo from the 'Ashes Fell Like Snow' exhibit, opening this week in Santa Rosa. Los Angeles photographer Roman Cho keeps a part of his heart in the North Bay. Cho often visits the friends in Healdsburg and Santa Rosa he's made in the course of his business, and enjoys cycling and other outdoor activities on his frequent trips. In September 2017, he even participated in the Levi's GranFondo competitive cycling event. "A week later," says Cho, "the city's up in fire." Staying connected with the region through social media, Cho witnessed an outpouring of help and relief efforts in the aftermath of the Tubbs, Nuns and Atlas fires, and was struck with how tight-knit the community grew at the time. "I felt compelled to contribute," he says. At the end of October 2017, Cho traveled to the North Bay for the first time after the fires and helped by doing what he does best—he took photos. Now Cho's collections of vivid large-format portraits and interviews with fire survivors will be shown together in the new outdoor public art show, "Ashes Fell Like Snow," that opens in Santa Rosa's Courthouse Square on Dec. 6. "I knew once the fire goes out, the media will move on to the next tragedy," says Cho. "At the same time, I knew that the people who were affected couldn't just move on. What they needed was continued attention. And the best way I could contribute was to photograph these people and help tell their stories." With that in mind, Cho reached out to Santa Rosa resident and cycling journalist Jordan Brady, who gave Cho four contacts to start the project. Those contacts turned into more than 30 individuals and families whom Cho photographed for the project. Subjects include Jean Schulz, who lost her Foothills home, and Johann and Gloria Heinzl, who had to evacuate twice the night of Oct. 9, first from their Santa Rosa home, then from the Sandman Hotel on Cleveland Avenue. Cho also shot portraits of those involved in relief and rebuilding efforts, including interim Sonoma County Sheriff Rob Giordano, Berkeley firefighters Clifford Broome and Michael Shuken, and outgoing Santa Rosa Mayor Chris Coursey. "I'm trying to get an encyclopedic overview of people affected," says Cho. "And everyone has been affected, whether you lost a house or not." For the past year, Cho has continued to collect stories and organize the new exhibit. The "Ashes Fell Like Snow" opening reception will feature guest speakers like Coursey, historian Gaye LeBaron and others sharing their experiences, as well as counselors from California Hope on hand to talk one-on-one with attendees. "The project was started to spread the word about what this community is going through," says Cho. "At the same time, I wanted to give the community a chance to pause and reflect on what happened, and to think about this past year so that they could not only remember the people and things they have lost, but also to celebrate the renewal and regrowth." 'Ashes Fell Like Snow' runs through Dec. 29 and opens on Thursday, Dec. 6, at Courthouse Square, Third Street and Mendocino Avenue, Santa Rosa. 6pm to 9pm. Free. ashesfelllikesnow.com.